Through the simple medium of Tempera paint, we learn to express our true nature and to explore our potential. Give yourself that! Experience the joy of rediscovering yourself and the freedom this can bring to your life. There are times in our lives when we must look beyond our selves to the places and people we come from - to where the exclusion began - in order to resolve and heal our creative blocks and our lives. Constellations offer the opportunity to experience and heal the relational entanglements that may be in the way of our true potential. Share the news. If you know someone who you think might like this email, please click this button. Don't worry, they won't be added to my mailing list. If they wish to receive my emails in the future, they can click on the signup button below. If you were forwarded this email, you have not yet been added to my list. Please join! I will never sell or share your information with anyone - ever. "Listening is such a simple act. It requires us to be present, and that takes practice, but we don't have to do anything else. We don't have to advise, or coach, or sound wise. We just have to be willing to sit there and listen." Without the presence of fellow painters it can be challenging to paint. I experience this over and over again when I put painting in my schedule and- for whatever reason- something comes up and I cannot go to my studio. Days pass and I have still not opened the studio door. At these times I miss the camaraderie of my painting friends who remind me to show up. A recent trigger propelled me back into the studio. I finally heard the voice to go and paint. I knew that painting was the only thing that would help me tolerate and hold what I was experiencing. I had no words to express my inner anguish. It felt very old/young, beyond and beneath words; perceived as sensation, impulse and image, the very thing a canvas could hold. I did not know where I was going, just what I was sensing and feeling inside, but the movement of the brush with color helped me move out what was inside, without having to know what it was about. Days later, after listening to that impulse to paint, insights occurred. Without the painting process I would not have moved as I did. I let the spark within the turmoil find its way out onto the paper. Hear the whisper calling you to create and find expression - in the company of others. This is not meant to be a one-time experience, but a practice. To honor this, I will offer two consecutive 1-day workshops this summer. Best if you can experience both days. If not, there is a 1-day option. Beginning September, in addition to workshops, a 6 -week class series will be offered. Stay tuned. Hope to see you there. In the last email I included a survey question: "What do you feel is holding you back in areas of your life?" Thank you to all of you who responded. This is truly wonderful insight that will help me address the things you need most. All the answer choices seem to be issues to varying degrees and I will be addressing these issues in the emails to come - starting with fear, followed by not knowing how to proceed which were both tied for the #1 answer. Thank you again. I am honored to be traveling on our journeys together. Please join me for . . . Please let me know if interested. Call Eve-Marie at 914.844.6213 to reserve your space or for more information. Private Sessions also available by appointment. 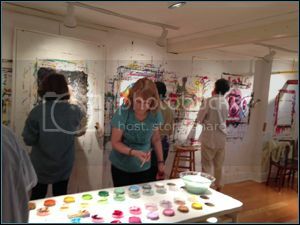 Final thought: This painting process helps us cultivate our inner listening and guides us to follow the impulses within. Then we can approach life differently.